Aquarium lighting has come a long way as researchers have sought more effective and energy-efficient forms of reef tank lighting. The good news is that their search has yielded fantastic results. We have moved from fluorescent and VHO lighting to metal halides, compact fluorescents, and now, LED. LED (light emitting diodes) can be described in the simplest way as a semiconductor that emits light anytime an electric current passes through it. LED lights are attractive and versatile and have found their way into various sectors, including industrial, commercial, and domestic use – including our aquariums. Compared to LED lunar lights, LED aquarium lighting for reef tanks are fairly new. They brought relief to reefers who found other forms of lighting inefficient, if not cumbersome. Installing LED lights in your reef aquarium will do various things. You can expect the tank’s aesthetic appeal to improve dramatically, but this is not all that will happen. In this article, we will explore the benefits of LED in reef aquariums and what to consider when buying LED Lighting. We will also take a look at some top products available today, to help you pick the best reef LED lighting for your aquarium. Advances in LED lighting technology have transformed into superior illumination capabilities that attract many reefers looking for high-quality lighting. There are hard corals and soft corals, with their main difference being in their structural makeup. Hard corals, also known as reef-building corals, are made up of hard calcium-based skeletons secreted by polyps. They are mostly found in shallow water and are generally photosynthetic in nature. The soft coral’s skeleton is made up of minute, spiny skeletal elements, known as sclerites. These sclerites give the corals their spiky and grainy texture, which is used for warding off predators. Soft corals use their tentacles to capture their food, known as plankton. Proper lighting is essential to the survival of coral – especially hard corals. Too much light is dangerous and can lead to death, while too little will inhibit growth. LED light fixtures are designed to provide multiple PAR (photosynthetically active radiation) values, capable of supporting and sustaining all the different coral species. Photosynthetic corals have a symbiotic relationship with light-sensitive algae, known as zooxanthellae. These zooxanthellae cells provide nutrients to the coral while the latter provides protection in return. During the photosynthesis process, the zooxanthellae cells generate oxygen as a by-product. Intensive lighting causes the production and accumulation of excess oxygen, which is toxic to coral. On the other hand, too little light hinders photosynthesis. You will notice a color change in your coral which will most likely be a dark shade of brown. With little light, the coral will require more nutrients to survive. They will need to host more zooxanthellae cells which, in turn, causes a change in color. What we perceive as a change in color is actually coral’s natural survival response. An LED reef light can mimic the natural light cycles by providing wavelenghts of light that is similar to that of the sun. Actinic blue is particularly important for vegetative growth. LEDs encapsulate this color, soft white, and a host of others to create the perfect living conditions for your plants, corals and fish. You can easily adjust light intensity and color to suit the needs of your aquatic life species. Many reefers have observed noticeable differences and growth in their plants and coral, days or weeks after installing LED Lighting systems. Conventional forms of lighting, such as incandescent bulbs or metal halides, are known to generate a lot of heat. This heat finds its way into aquarium water, raises water temperature and endangers delicate aquatic lifeforms. Previously, cooling fans had to be used to help dissipate the heat. LED lights, on the other hand, are energy efficient, which means they generate less heat. They come with built-in fans and heat sinks that effectively disperse heat, thereby maintaining normal and optimal water temperatures. The life expectancy of an LED bulb is 50,000 hours. If you run the LED lights to mimic sunlight hours, approximately 12 hours every day, these bad boys will last you 11 years! This is in stark contrast to traditional lighting sources such as fluorescent tubes, which require replacement far more often. With LEDs, you can forget about buying bulbs for a very long time. And this all translates to reduced maintenance on your part and saves you money, too. Size is a major concern for reefers since you want a lighting source that will cover every inch of your aquarium, while not taking up much room. LED light bulbs are clustered to provide focused, directional lighting, so all light produced can be directed to precisely where you need it, while none goes to waste being projected upwards, sideways and out of the tank. Another cause of concern for many aquarium enthusiasts, and those looking to start the hobby is the running costs. You will need to look at electricity rates and maintenance among other things when it comes to lighting. And with LEDs, the initial setup cost is high compared to older style tubes and bulbs. However, this amount is soon countered by the much lower running costs. One of the biggest selling points for LED lighting systems is their energy efficiency. LED bulbs use up to 85 percent less power than traditional light sources but offer more power efficient illumination. This translates to significant savings on your monthly electricity bill. The long lifespan of LED bulbs also means that a decade can go by before you need to replace them. Now, compare this to other light sources that require replacement every nine months or so. Inbuilt fans and heat sinks mean that you don’t have to spend money on chillers (and the operational expenses that come with them). This has to be one of the coolest features in LED lighting systems. You can introduce special effects into your aquarium, such as cloud cover, lightning storms, and water depth, among others. Exposure to bright light over extended periods of time can damage your coral, stress the fish, and cause algae overgrowth. None of which is good for the aquarium inhabitants. Most LED lighting systems effectively mimic natural light cycles, such as sunrise, bright day, sunset, and even moonlight. These cycles contribute toward a healthy living environment for your fish, coral, and other life forms. You can use dimmer switches to create different color combinations that enhance viewing while allowing your fish to rest. If you have nocturnal fish, they will enjoy feeding under a dim blue light – and you will enjoy watching them! Reef LED lights come in all shapes and sizes and provide a host of benefits for your tank and its inhabitants. Yet, not every LED lighting system out there will work for you. In this section, we will go through some things that you need to consider before buying LED lighting. Paying attention to these considerations will ensure you end up with the best reef LED lighting for your needs. This is the most important consideration of all. Do you own a small aquarium, a medium-sized one, or a king-sized monster tank? Different LED lighting systems will only physically fit different size tanks. Some are too big for small tnaks, and some are too small to efficiently light a large tank. Different lights also have distinct lighting capacities and coverage. It is important to buy one that offers you maximum coverage and light intensity. Knowing the size of your tank will help you shortlist the types of LED that you should be looking to buy. Who will be living in your tank? Do you want to keep live corals or the ornamental kind? If you are thinking about live coral, which ones will they be? Soft corals, LPS, SPS, or a mixture? If your coral is young, you will need to identify an LED lighting system that enhances growth. Some LED lights helps coral grow, but only to a certain phase level. Are you comfortable with this? While corals are important in a reef tank, the needs of the other inhabitants, like the fish and marine plants should also influence your decision. Take time to understand their lighting needs before making a purchase. This is the one thing so many of us ignore. We get carried away by the sleek design and fancy features until we have to operate the light. Today’s LED lights can be operated manually, via remote control, and even on smartphones. Some use knobs while others offer touch control pads. If you’re a bit of a technophobe, choose the lighting system that you are most comfortable operating. However, if you have your heart set on a lighting system with controls that seem a little too complicated to understand, make YouTube your best friend. Plenty of enthusiasts have uploaded helpful videos about using their lighting systems. You can also call up the manufacturer’s customer service team for help. How far does the light penetrate? This is especially important for big tanks that require LEDs with superior light penetration abilities. Some LED lights are fully controllable and come with inbuilt timers. Others don’t, which means you will need to manually switch the light over every time it needs changing. Ask yourself if a 24-hour light cycle setting is on top on your list of must-haves or are you okay without it? What about special weather effects? 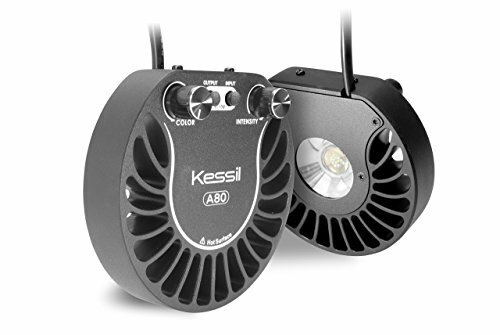 No two models are completely alike and manufacturers design LEDs to suit different needs. Some cover basic requirements while others go the whole nine yards. It’s a question of preference. The better the build quality, the more durable the LED light will be. Look for sturdy lights that can withstand handling and exposure to saltwater without falling to pieces. Some models are quite delicate, limiting their handling which, in turn, makes it difficult for you to work around them. Additionally, the light lens should be able to serve you for a long time without blowing up. In most cases, the build determines how much you pay for the lights, be wary of very cheap models. They may not last long. Do your research, go online and check out the reviews of the product you want to buy. Pay attention to the issues raised by other buyers, particularly if several consumers mention the same problem. When it comes to aesthetics, you should consider both the external as well as the internal visual appeal. Many people find aquariums naturally intriguing and are drawn to them. Wherever your tank is located, its spectacular visual appeal should not be disrupted by ugly light fixtures. It’s important for you to pick a fixture that looks good whether it’s mounted or suspended over the aquarium. You can choose a sleek modern design or a low-profile type that blends in. Maybe you’d like a bulky fixture that looks like a science experiment? It all depends on your preference. The internal appeal is all about having good color combinations, no disco ball effects, and no visual hotspots. Try to keep the interior look balanced. Choosing the best reef lighting can be somewhat mind-boggling. With so many products on the market, how do you pick the best? Is it about aesthetic appeal, ease of use, lighting that enhances growth, or techy products? It is likely that you already have a list of features and requirements that your choice should meet. Up next, we will share with you what are, in our opinion, the best options for LED reef lights including a few pros and cons for each. 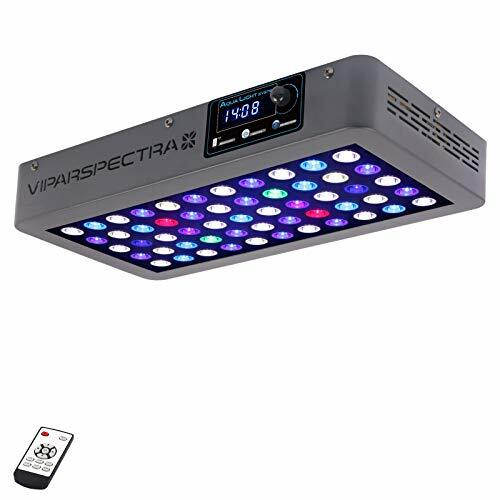 This Viparspectra dimmable full spectrum model offers great value for money. Although at the top end of the price range, it is designed to satisfy very high standards. The manufacturer states that it considered customer input when coming up with this lighting system. Its amazing spectrum of light makes it possible for photosynthetic corals, exotic fish, and algae to thrive. These light conditions also support a host of marine plants, making it easy for them to photosynthesize. The in-built timer can be operated by anyone even half-way tech-savvy, allowing you to control and customize the LED light system with ease. From setting separate intensities, color changes, and the on and off times, this product is well worth the price. Dimensions: 16 inches by 8.5 inches by 2.4 inches. Awesome color and dimming options. Can enhance the growth of coral and other aquatic life. Has remote control and an inbuilt timer. The discerning and discriminating buyer will find the features in this product well worth their money. From the top-notch aesthetic appeal to providing ideal light conditions for marine life to thrive, this light is a contender for the top spot. Purposely designed for LPS and SPS corals, this LED lighting model was clearly built with reef tanks in mind. Its sleek and slim design offers you low energy consumption, and the various size options make it a favorite among reefers. It’s technologically advanced and just may be the most complicated LED light you can operate. That said, it comes with fantastic features such as the 24-hour light cycle which mimics natural biorhythms. It imitates sunrises, bright daylight, sunsets, and even moonlight. The weather effects, such as cloud cover, lightning storms and fading lunar are a delight to watch. You will find Orbit Marium’s brightness impressive, providing excellent lighting for your aquarium. One more feature to love about this model is the sliding docking legs that let you adjust and install the system easily. Dimensions: 22.8 inches by 3.5 inches by 0.4 inches. Light and wave pump controller wall-mounting bracket. Light HUB wall mounting bracket. Ability to mimic natural light cycles. Slow ramp up, which prevents light shock to your fish. Programming the product is challenging. Docking legs can eventually rust. This model is energy efficient and designed for widespread lighting, maximizing light to every corner of your aquarium. This distinctive-looking light can be operated manually or with remote control. Its ease of use allows you to ramp up the intensity from zero to extreme brightness. The Kessil A160WE has a solid and sturdy feel, with a slippery, smooth and satin-like finish. It comes with a fan that enables cooling. A great feature of this model is that the fan works very quietly. It offers some of the very best shimmer effects in LED reef lighting. This light model imitates the natural daylight allowing your fish and coral to thrive. Dimensions: 4 inches by 2.48 inches. Lights in a daisy chain fashion. Awesome lighting and shimmering effects. Does not go as dim as some would like. The new and improved Aquatic Life Edge LED light fixture was designed to tackle the issues experienced in past models. One of the problems faced in those past models was the lack of a backup battery. This proved frustrating to users who had to reprogram the lighting every time there was a power outage. This issue is now fixed! 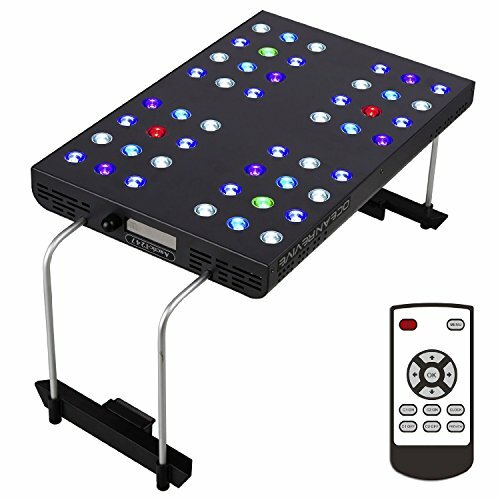 Reef Edge LED fixture includes the full spectrum of light settings and can be set up for sunrise and sunset effects. It also has a built-in moonlight mode with a blue glow which adds a wonderful shimmering effect throughout the tank. This product’s sleek, low-profile design makes it almost invisible over your aquarium. 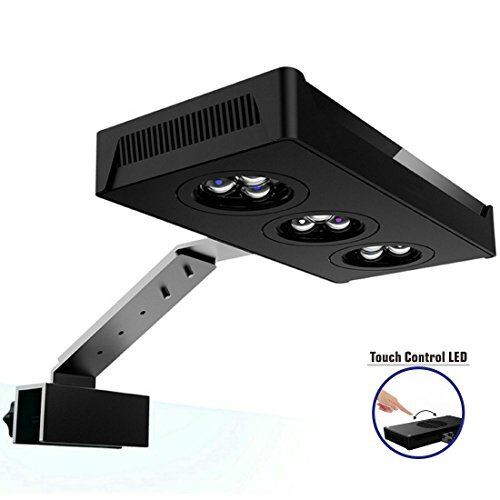 It enhances aquatic life by using high-level LED technology to provide maximum light output inside the aquarium. Dimensions: 35 inches by 4 inches by 0.7 inches. Delicate and needs to be handled with extreme care. This model is great for hobbyists who can’t stand noisy fans. The moonlight setting is fantastic for those who keep their tank in the bedroom. Power outages won’t cause a problem with this model, thanks to the back-up power source. This LED light comes with support brackets and a hanging kit to facilitate suspension over the tank. 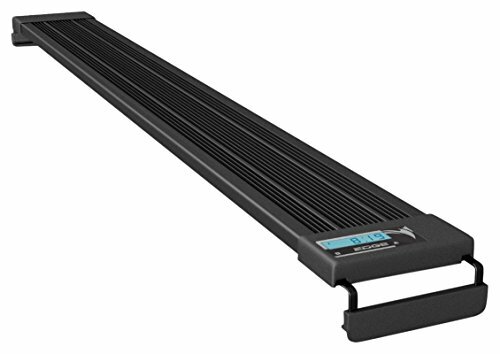 It is ideal for both freshwater and saltwater aquariums and is more than capable of supporting a wide range of aquatic ecosystems and marine organisms. This product features 90-degree optics, a built-in timer, and two channels, blue and white, controlled independently via remote control. The supporting brackets are designed to expand light coverage in terms of both depth and width. These features provide the ideal conditions for soft corals, SPS, and LPS corals, and reef fish to thrive. Two quiet cooling fans that help disperse heat make the OceanRevive Artic-T247 a cool LED light to have. Dimensions:15.8 inches by 10.2 inches by 1.6 inches. 1 Lithium metal battery required. One remote control with a battery. Supporting brackets and hanging kits. No sunrise and/or sunset simulation or moonlight capability. NICREW Classic LED aquarium lights are good value for money and meet the basic requirements for both freshwater and saltwater tanks. This light fixture is energy efficient and uses two lighting modes – white and blue. The combined white and blue LED light is great for daily use while the blue light alone creates a spectacular atmosphere at night. As far as lighting goes, NICREW LED lights offer a high level of brightness, capable of reaching every corner of your fish tank. It is excellent for growing plants. It should be used over glass-covered or acrylic-covered aquariums as it isn’t waterproof. This product comes with adjustable metal brackets to help you cover more ground. Provided the tank’s thickness does not go beyond half an inch, the brackets will fit aquariums from 20 to 24 inches. Other sizes are also available. Dimensions: 5 inches by 4 inches by 1.4 inches. This model meets only the basic requirements for LED lighting so don’t expect extra features. But if you are looking for affordable and adequate lighting, the NICREW LED is the right candidate for the job. 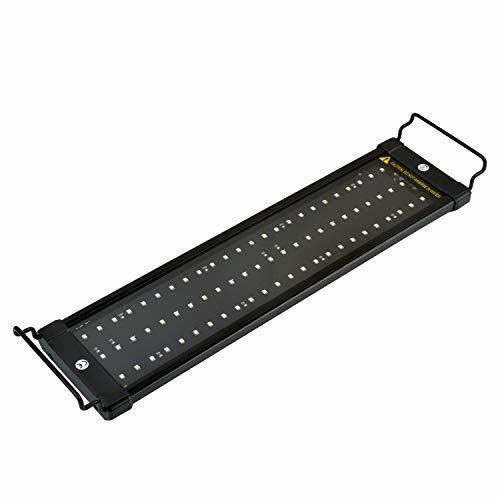 This LED Light is designed for use in small and nano aquariums that have less demanding corals. Its unique shell-shaped design ensures effective light distribution throughout the aquarium, and it requires no fan. 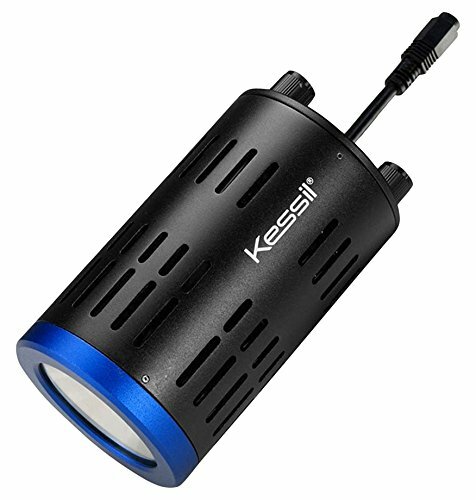 The Kessil Tuna Blue A80 LED light has half the intensity of the Kessil A160 but with all the features, colors, and controls. All controls are located on top of the head, making it easy and convenient to use. You can adjust light intensity and color without much hassle. This model is made up of five individual LED lights tightly packed together, and a secondary lens. These provide a well-mixed and concentrated single source of light. Advanced optics and dramatic glitter lines (no “disco effect”) make this product ideal for soft corals, LPS, algae, and clams. The Kessil A80’s coverage is 14 to 24 inches. It comes with an optional gooseneck clamp/mount, with a shorter “neck” to accommodate smaller light and smaller tanks. It is also compatible with the Kessil Spectral Controller. Dimensions: 4.88 inches by 0.98 inches. Optional accessories such as gooseneck clamp/mount and A-Series spectral controller. Light intensity will not work for very tall and deep tanks. The Hipargero LED aquarium light is designed to enhance the growth of most types of corals typically found in saltwater. The system features a 90-degree, three-in-one acrylic lens that ensures lighting efficiency and color uniformity. Speaking of color, this product aims at mimicking the deep-sea environment by offering 3-watt high-power Cree LEDs. You will have access to premium lighting in the form of Cree royal blue, Cree blue, and Cree white. This colorful spectrum makes absorption of vitamin D3 easy which in turn, helps the coral take in calcium and flourish. What’s more, you can use touch control buttons to regulate light intensity. It adjusts easily from 0 to 100 percent intensity. This product also boasts intelligent built-in fans that intuitively modify their speed depending on the temperatures. Dimensions: 8.7 x 4.3 x 1.2 inches. Offers day and night lighting. Recommended daily use of 8-10 hours. You can’t use it non-stop. Some users experience difficulty when mounting this light onto rimmed aquariums. This model is an excellent choice for anyone looking for an LED light that provides great aesthetics, is intuitive, and easy to use. The price range is good given the number of features. The fact that the light can only be used for a certain number of hours per day is a bit of a drawback, though. With everything going mobile, this lighting system has not been left behind. 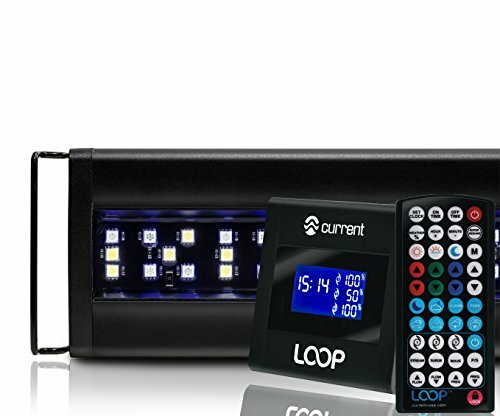 This tech-savvy LED light allows you to control everything from your smartphone, Android device, or computer. You simply download the app, known as myAI, log in, and then set a programmable lighting cycle that suits your needs. The app allows you to play around with the color spectrums to find the ideal settings for your aquatic life. The light is bright enough for a small tank, and it will keep your corals healthy and happy. This model also has an acclimation setting perfect for gradual turning up of light to prevent shock. The Prime HD can be suspended over the aquarium with hanging kits or mounted on the aquarium. These mounting options permit flexible placement, and they allow you to focus the light where it is needed most. Dimensions: 4.88 inches by 4.88 inches by 1.34 inches. Not suitable for larger aquariums. Some users have expressed difficulty when installing the app. Some problems with the app’s connectivity. 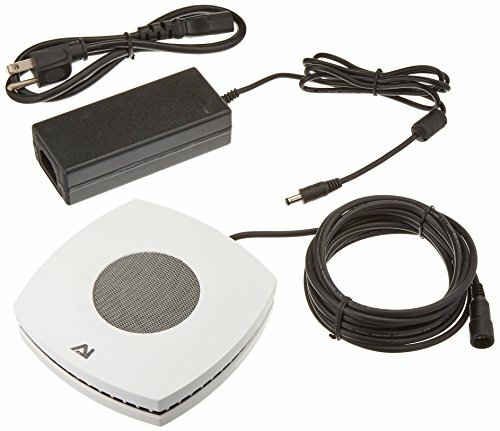 This is a fantastic option for the tech-savvy aquarist who wants to control their aquarium lighting from their devices. It is a high-tech lighting system designed to support plant and coral growth with amazing results. Choosing the best reef LED lighting for your aquarium starts with understanding the benefits of each light source along with its downsides. LED lighting systems offer you tremendous benefits, such as high energy efficiency and low running costs. Not to mention the ways in which LED lights help to support aquarium creatures and plants. LED lighting manufacturers have brought out many and varied products, so you will be spoilt for choice. It’s important for you to take the time to figure out what you need and any preferences you may have. This will go a long way toward choosing the right lighting system for your specific aquarium. If you have any questions or comments, please do leave them in the comment box below. We will answer every one.